The rise of multiple militia factions in Syria that come under the mantra of 'Syrian Hezbollah' is now a well-established aspect of the conflict. The most well-known of these groups is Quwat al-Ridha whose origins lie in the Homs area. One problem in researching these groups is the difficulty in obtaining much concrete information about them, with a general reluctance on the part of their members and leaders to talk to outsiders. A case-in-point of this open-source obscurity is al-Ghalibun ("Those who overcome"- a reference to Qur'an 37:173: 'And indeed our soldiers are the ones who overcome'). The group has a social media presence that emerged in 2015, but aside references to some areas of operations (e.g. in Aleppo and Quneitra provinces and Palmyra), some 'martyr' claims and name and emblem changes, precious little data of value can be found in that social media presence. However, a friend who was in al-Ghalibun was able to speak with me about the group. When I first came to know him, he was still in the group and refused to tell me anything about it, indicating at the time that he was not authorised to speak about it. In subsequently speaking to me about al-Ghalibun, he was not doing so as a 'defector' purporting to expose inside dirt on the group. Rather, he had simply left al-Ghalibun out of a desire to find a better source of income to support his family. This friend still knows people in the group, and prefers the regime in Syria over the rebels/opposition. His information has proven helpful in the account I present below. While, as stated above, al-Ghalibun's social media profile emerged in 2015, its origins apparently go back much further to the 2012-2013 period. Its existence was simply kept low-key in those earlier years. From elsewhere in the Syrian civil war, there are of course many examples of groups that trace their beginnings to the earlier years of the Syrian civil war but did not emerge with a clear profile on social media until much later (e.g. Liwa al-Baqir in Aleppo and the Leopards of Homs). At the head of al-Ghalibun has been a man going by the name of Abu al-Meqdad, his real name being Rami Yusuf. Originally from Latakia province, he was of Alawite origin but is said to have converted some time ago to Shi'i Islam (that is, the Twelver denomination, which is hereby the denomination specified in this piece). He has also had long-standing connections with Hezbollah, reputedly participating in the 2006 war against Israel. For comparison, the same claim of participating in the 2006 war against Israel is made about the two brothers who established Liwa al-Baqir: al-Hajj Hamza and al-Hajj Khalid. A current al-Ghalibun member from Jablah in Latakia province also affirmed the claim that Abu al-Meqdad participated in the 2006 war against Israel. However, the foundational base for al-Ghalibun was not in Latakia province, but rather the Sayyida Zainab area, home to Syria's most important Shi'i shrine and a number of militia faction bases. Along with Abu al-Meqdad in the initial stages came a number of people from the Syrian coastal areas (Arabic: al-Sahel al-Souri) who knew Abu al-Meqdad personally. For example, one important figure in al-Ghalibun is a man called Abu Hayder, who has played a role in training personnel. 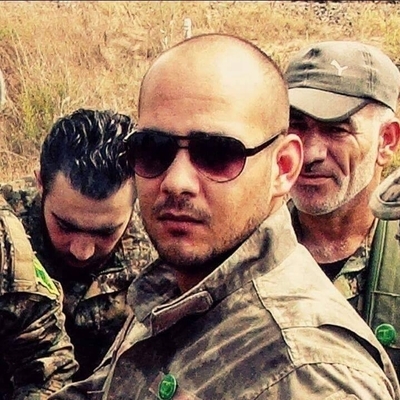 He is from Latakia and is of Alawite origin, but has been Shi'i since 2012. From this basis, other people from the Syrian coastal areas could have joined al-Ghalibun via knowing one of Abu al-Meqdad's personal connections. The two brothers Daniel and Darid al-Atrash, originally from the Latakia village of Ayn al-Bayda (primarily Alawite village) and converts to Shi'i Islam reportedly killed while fighting for al-Ghalibun in Quneitra in 2015, were apparently friends of Abu Hayder. It is important to remember the role that knowing someone in a particular group plays in recruitment of people into that group, as my colleagues Shiraz Maher and Peter Neumann have also demonstrated with regards to the recruitment of Western foreign fighters into Sunni jihadi groups in Syria. The other main contingent of recruits into al-Ghalibun in the early days seems to have come from the Damascus area, where many Syrian Shi'a reside. My friend is himself of Syrian Shi'i origin. He joined the group on hearing about it from friends, who noted the group was offering a salary. This salary amounted to $100 a month. The salaries for the group have been distributed in cash via the Iranian embassy in Damascus, illustrating Iran's role in helping to finance al-Ghalibun. In a similar vein, officials in Hezbollah have played an oversight role over Abu al-Meqdad. This shows the level of Iranian and Hezbollah involvement in the Syrian Hezbollah groups, rather than an analytical model that conceives of these factions as mere wannabe start-ups. In the beginning, it was required for members of al-Ghalibun to be Shi'a, whether through being of Shi'i origin or through conversion to Shi'i Islam. This policy though has shifted to accepting non-Shi'a without the requirement for conversion. Hints of this shift could be observed in the evolution of the group's names and symbols on social media. 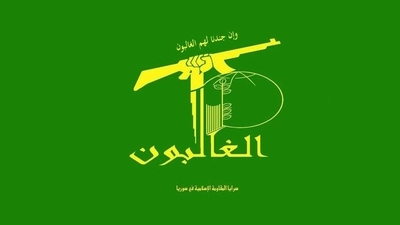 Indeed, the group's first full name and emblem reflected a clear Shi'i "Islamic Resistance" identity. Observe the first emblem below. First emblem of al-Ghalibun. Note the familiar extended arm and rifle as well as the globe, characteristic of Hezbollah and Iranian Islamic Revolutionary Guard Corps imagery. 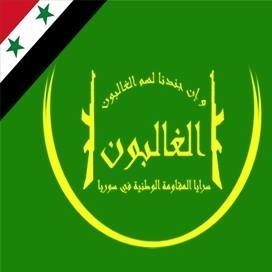 The group's first full name, as per this emblem, was: "al-Ghalibun: The Islamic Resistance Brigades in Syria." The group's emblems and names have subsequently taken on a more Syrian nationalist image. In August 2016, the group adopted a new name and incorporated the Syrian flag into its emblem, as per below. The second emblem of al-Ghalibun. Note that the extended arm and rifle as well as the globe remain. However, the Syrian flag has been incorporated into the top-left of the emblem. Note also the name inscribed on the bottom: "al-Ghalibun: The National Resistance Brigades in Syria." Yet another change occurred in January 2017, shifting further away from Hezbollah and Iranian Islamic Revolutionary Guard Corps imagery. 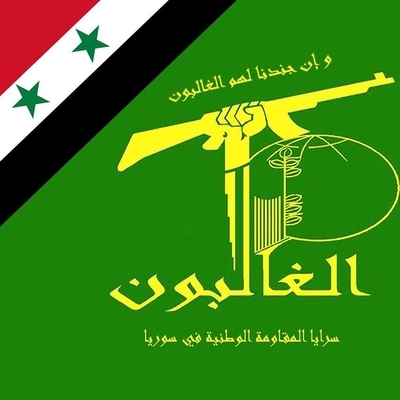 The January 2017 emblem of "al-Ghalibun: The Syrian National Resistance Brigades." Note the dropping of the extended arm, rifle and globe. In their place are two rifles flanking the main emblem, and a Dhu al-Fiqar style sword image around much of the main emblem and rifles. A final change occurred in March 2017, according more prominence to the Syrian flag. 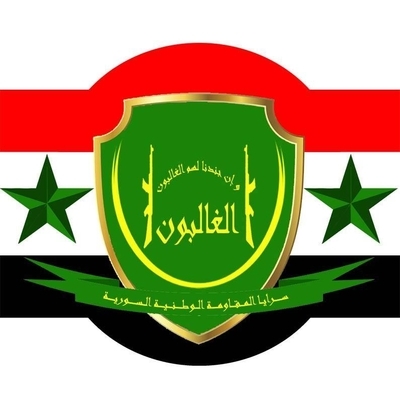 It should be noted that the shift towards a more Syrian nationalist image among 'Islamic Resistance' groups is not unique to al-Ghalibun: compare with the emblem shift of Liwa al-Sayyida Ruqayya. The group is now said to have many non-Shi'a in its ranks. There are no compulsory ideological indoctrination classes. Thus, in so far as conversion of non-Shi'i members is a goal, it is pursued through more subtle means: that is, alongside the financial and military support from Iran for the group, recruits might be given books on Shi'i Islam for perusal. The idea is that you should wish to convert to Shi'i Islam out of your own conviction and contentment. 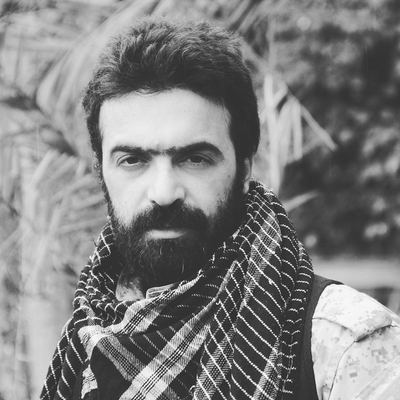 The most recent developments surrounding al-Ghalibun this month are that Abu al-Meqdad has apparently moved on through 'promotion', taking on a more senior role with Hezbollah in Syria, and that his position as leader of al-Ghalibun has been assumed by one Abu Hadi Abbas, originally from Lebanon but residing in the Sayyida Zainab area. This new leader had worked with Iran's Islamic Revolutionary Guard Corps and had trained in Iran. Some personnel are said to have been brought in from Lebanon, along with some personnel from the ranks of the National Defence Forces. Meanwhile, a recruitment office has apparently been opened in Aleppo, but not using the name of al-Ghalibun, rather only part of its name: "The National Resistance Brigades." This move is likely meant to facilitate further recruitment among non-Shi'a. As far as the size of the group goes, al-Ghalibun is relatively small. Its fighters likely do not exceed the hundreds in number. Yet there is a clear desire to expand recruitment. In the aggregate, the Iranian desire to turn the Syrian Hezbollah movement into a real political force in Syria is evident. Yet the immediate problem such a project apparently faces is that the Shi'a constitute only a very small proportion of the Syrian population. It cannot realistically be expected that Syria can be transformed into a country with a Shi'i plurality or majority that can create the Islamic Republic of Syria on the model of Iran's system of government. Even making the Shi'a a substantive minority of 10-20% in Syria would present a significant challenge. It should also be remembered that in Lebanon, where Shi'a constitute a much larger proportion of the population, the powerful existing Hezbollah movement cannot transform the entire country into the Islamic Republic of Lebanon. Incorporating more and more non-Shi'a into Syrian Hezbollah, with any conversions to Shi'i Islam through more subtle means a bonus, is a logical step in trying to make the movement a meaningful political force- something that will give Iran more staying power in Syria's affairs. In the nearer term, promoting Iran's ideology of wilayat al-faqih ('guardianship of the jurist') among the existing Syrian Shi'a populations through Syrian Hezbollah, and other Shi'a across the region through the jihad in Syria more generally, is a realistic goal for Iran. (Update 19 April 2018): Like other 'Syrian Hezbollah' groups, al-Ghalibun has become a part of the Local Defence Forces network.